The man gave one last wink and then trotted his way back behind the kitchen doors of the cafeteria. It would be years before Gary would ever see Herbert again, but his encouraging words were all the inspiration he needed to continue his dream. After high school, Gary headed off to Rutgers University where he studied food processing in its world-renowned Food Science department. Gary loved learning about food so much, that after receiving his Bachelor of Science degree, he continued his studies at Rutgers and achieved a Master of Science degree. This led to his first job as a technical service supervisor for a major food ingredient supplier – the perfect place to gain some real world insight into the food business. By the time he was ready to break out on his own and change the world - or at least how people snacked in it - Gary had gained years of knowledge about the food industry and a wealth of insight into the business of snack foods. But the journey was far from over. Although Gary had left his job to start his own company, he was still missing that key product that would turn his dream into a reality. While Gary’s determination never wavered, as the days passed, the missing final ingredient grew more and more elusive. To make matters worse, the cash in Gary’s checking account was quickly disappearing. He barely had enough money to buy himself lunch, nonetheless start his own food company. One day while sitting under a tree in the park, desperately racking his brain for the ultimate piece to his snack food puzzle, a faintly familiar voice interrupted his thoughts. The man had grown a few inches over the years, and his overalls had become slightly tattered, but Herbert was still happy and his bright smile hadn’t changed a bit. Gary immediately recognized the friend who had first encouraged him years ago. Gary tasted the pretzel and was immediately blown away by its satisfying crunch and mouth-watering flavor. Herbert turned around to wave and replied, “Remember Gary, follow your dreams every day...” Gary interrupted, "Yes, I remember...wear a smile come what may and help people along the way. Will do, Herbert, will do." At last, the final ingredient had been added, and Gary’s dream would soon be fulfilled. Shortly after, he had formed a partnership with the Amish pretzel bakery and the Handmade Penn Dutch Pretzels became a roaring success. 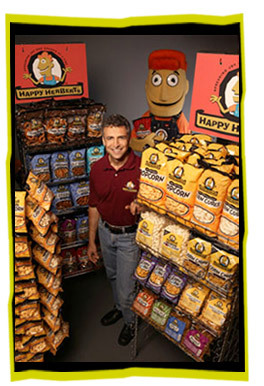 With his growing reputation as a successful snack entrepreneur, Gary was able to convince a number of top-notch snack companies to make products for his rapidly expanding line. Gary also sought out help from the man who inspired him so much. Herbert embodied the joy and happiness that Gary wanted his customers to experience when snacking on his products, so he offered Herbert a position in his company – Head Mascot. In fact, Gary even named his company in honor of him, calling it…Happy Herbert’s Food Company. Happy Herbert’s now offers almost 30 tasty, wholesome, fun-to-eat snacks, a far cry from the carrot sticks, broccoli, and junk food from Gary’s past. With a lot of hard work, and some help along the way, Happy Herbert’s continues spreading joy to its legions of loyal smiling customers…one crunch at a time!